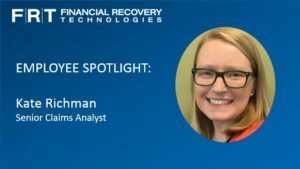 Kate Richman is a Senior Claims Analyst for Financial Recovery Technologies dedicated to claims recovery. She is involved in the processes of filing claims, curing claim deficiencies and documentation audits, and processing recovered funds in preparation for remittance to the client. What are your top priorities and biggest challenges? My top priority is making sure that all claims and clients file on time. I never miss a deadline. It is a challenge, especially if there is a client that comes in last minute, but I will stay as late as I need to and do everything in my power to make sure that they get filed on time. Normally I come in, read my emails, and check any Jira tasks that came in overnight. Then, I start filing claims. Filing a claim starts with determining eligibility and what clients I can file as soon as possible. The next step in filing a claim is to analyze the spreadsheet and make sure all of the transactions are accurate to ensure a complete filing. Claims filing concludes with compiling a pdf of relevant information and sending it off to the correct claims administrator. Typically I work from the deadlines, so whenever there is an upcoming deadline, I make sure to look at those cases and see which ones are most pressing. If you woke up with 2,000 emails, and could only answer 200, how would choose which ones to answer? I work based on what comes in first and what needs to be done first. I would check and answer the oldest ones, because those are the ones that need to get done first. And then if I still had more time, I would look at ones that were specifically addressed to me. Keeping my clients and coworkers happy is extremely important to me, so if someone is directly asking something of me, I am going to make sure I focus on them and address their questions or concerns. What is FRT doing to ensure they are adapting to the changing landscape of the class action industry while continuing to meet the needs of current and future clients? FRT does a great job staying on top of the new and different shareholder class action cases both in the U.S. and abroad, as well as constantly creating new processes to ensure a complete and accurate filing of those cases. We are seeing a lot more antitrust settlements and those non-securities cases need a different approach than your typical domestic class actions. Prior to the LIBOR case that was due in December, we didn’t have a formal process for antitrust cases or even global group litigation settlements. Today, we have step-by-step procedures of what to do specifically to each case and each case type. What is the most valuable lesson you have learned during your tenure at FRT? Mistakes happen and you cannot take it personally. Although I am a very emotional person, I strive to make every single client happy and their case perfect. When a mistake happens, you can’t let it get the best of you. Your work and your client comes first. What is one piece of advice that has changed your professional career? One piece of advice that has stuck with me is to not take your career for granted. I’ve been at FRT for 4.5 years, and I come to work every day as if it’s my first day here. FRT instills an accepting, curious, caring and positive environment. If you are too absorbed in your work and don’t take a step back to appreciate all the people who help you, you will miss out on a lot of experiences. FRT is a great company and if you’re doing your job, and doing a good job, you’ll have nothing but a great experience. Success is not only being good at what you do, but also enjoying what you do. I believe that if you are happy and appreciative of all that is around you, you will be successful not only in a work setting, but also in life. For more information on what our employees have to say about their experiences with FRT, check out our careers page. 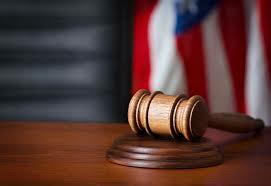 Forex Antitrust Litigation: How do I know whether I’m eligible for recovery? You likely already have a sense for whether you traded in FX Instruments during the Relevant Period; however, if you’re unsure, here’s some guidance to help you make that determination. A. Did you (i) trade in FX Instruments (ii) with one of the defendants (iii) during the Relevant Period, and (iv) do you meet the U.S. nexus requirement? The “Exchange Only Settlement Class” – those who, from January 1, 2003 through December 15, 2015, entered into an FX Exchange-Traded Instrument, where such persons were either domiciled in the United States or its territories or, if domiciled outside the United States or its territories, entered into an FX Exchange-Traded Instrument on a U.S. exchange. In considering whether a trade by a non-U.S. domiciled person was transacted in the United States, the Claims Administrator will look to where it was priced, placed, booked, financed, cleared and/or settled, or whether it was entered into on a U.S. exchange such as the CME or ICE Futures U.S.
B. Who is likely to have traded in FX Instruments? There are essentially two categories of FX traders. First, there are those who participate in the FX market as a component of their investment strategy by placing bets on the movement of various exchange rates in relation to others. Institutions of all shapes and sizes invest in FX Instruments in this manner. If your institution does invest in FX Instruments, your investment team will know it, and will likely be able to give you a sense for what percentage of your portfolio is comprised of those instruments in order to assess the magnitude of this opportunity. The other category relates to hedging. When institutions invest in foreign stock, for example, they typically assume a degree of currency exposure on top of their equity returns. The currency risk increases during periods when the underlying currency is rising or falling relative to the institution’s domicile currency. Many choose to hedge at least a portion of their currency exposure through various FX Instruments. Related to the hedging category, there are also companies that conduct a large portion of their business overseas. (Think, for example, about a multinational technology company that is purchasing large amounts of component parts from many different countries with those contracts denominated in various countries.) The company may choose to invest in FX Instruments to address contract price fluctuations. C. Is anyone explicitly excluded from the settlement? There two settlement classes expressly excluded: the defendants themselves, their co-conspirators, officers, directors, employees, affiliates, and entities in which the defendants have a controlling interest. These persons and entities are not eligible for recovery. There is an important exception for certain investment vehicles in which a defendant has a direct or indirect interest or as to which its affiliates act as an investment advisor, but of which the defendant is not a majority owner. These investment vehicles are not excluded. Maximize your FX recovery and reduce the effort required on your part to analyze, file and recover with FRT. To help our clients accurately assess their exposure, we have augmented our existing expertise in class actions with FX industry experts who have four decades of experience in FX trading and execution. In short, we have you covered to manage this exceedingly complex case from beginning to end. Contact your FRT representative or email us at info@frtservices.com to learn more. For more information on this case or other securities, global, and antitrust class action litigations, please contact Financial Recovery Technologies at info@frtservices.com.